Pxl brings digital art effects to your iPhone and iPad photography. 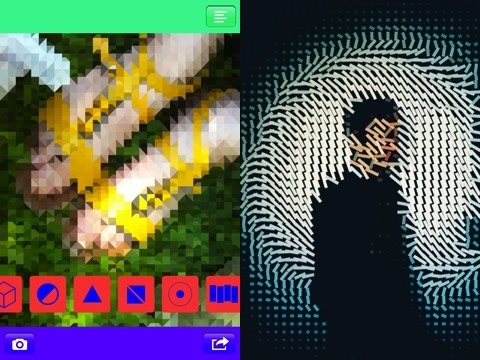 The Pxl universal app from artist Rainer Kohleberger gives a graphic, bold, artistic edge to your photo library with a cache of gesture controlled tools. Like other photo apps, Pxl allows you to shoot photos from within the app, or you may select a photo from your iPhone and iPad libraries. The photo chosen is instantly transformed to a pixel image on your device’s screen. All of the tools to manipulate the image are accessed with gestures on the screen. By swiping your finger across the green bar at the top of the screen, you adjust the intensity of each image. On the bottom part of the photo, you scroll through the different pixel shapes. With a tap on the shape, the Pxl iPhone art is quickly updated to the newly selected shape. 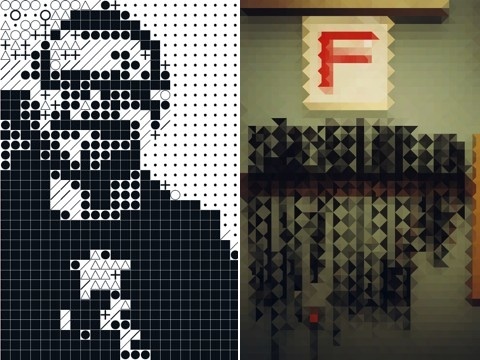 You can choose pixels shaped as dots, angled rectangles, cubes, graphic-infused black and white circles, triangles, mirror-image triangles within a square, and vertical rectangles. It’s exciting and fun to scroll through the different shapes, as an adjustment in the pixel shape dramatically impacts the image produced by the Pxl universal download. The intensity adjustment with gestures at the top of the screen provides color changes for some pixel shapes and changes the size of the pixels for others. To amplify the intensity even more, you can pinch on the screen to shrink and enlarge the pixels. The larger the pixel generally means the image produced by the Pxl universal download more accurately reflects the picture from your device’s library. When you pinch the image and the pixel shape decreases, then the image becomes more edgy, graphic, and cutting-edge. If you want to let Pxl transform your image, you can go to the settings menu to activate the shake feature. Then, as you shake, Pxl’s universal download instantly transforms your image. This is a really cool feature. In many ways, I preferred the visually compelling and cool perspective generated simply with the shake. Pxl also incorporates easy one touch sharing with Twitter, Facebook, and email. You’ll add quick, progressive punch to your Facebook timeline, Twitter feed, and blogs with Pxl’s reasonably priced universal download. AppSafari review of pxl. was written by Jenni Ward on April 10th, 2012 and categorized under App Store, iPad apps, Photos, Universal. Page viewed 4418 times, 1 so far today. Need help on using these apps? Please read the Help Page.